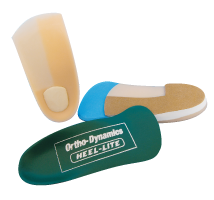 Semi-flexible to rigid all purpose orthotics designed for maximum shock absorption protection. 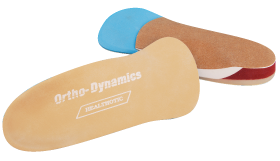 Activity: A multi-purpose orthotic for use in a variety of walking shoes. Components: Offered in 3mm or 4mm subortholene shell. Extrinsic 55 durameter EVA rear foot post and 45 durameter arch filler. Shell top covered with layer of 1/8 poron for comfort and full length felt protective undercover. Available in met, sulcus or full length. Footwear: Full depth dress shoes or athletic shoes. Activity: Designed to provide semi-rigid to rigid control and stability and address heel spur syndrome. Components: Offered in 4mm or 5mm subortholene shell. Extrinsic 45 durameter EVA rear foot post and arch filler. Heel shell (punch out) filled with sponge rubber. Shell top covered with layer of 1/8 poron for comfort and full length felt protective undercover. Available in met, sulcus or full length.